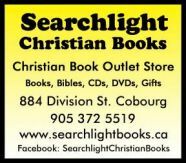 Welcome to the Local Church Directory page sponsored by Searchlight Christian Books in Cobourg. 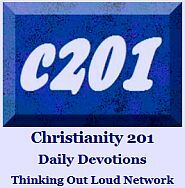 Click here to go to the Searchlight Christian Bookstore main page. Other area churches include St. Andrew’s Presbyterian, Rice Lake Vineyard, Trinity United, Rural Faith United, Fellowship Baptist, St. Michael’s R. C., and many United and Anglican Churches in Grafton, Colborne, Salem, Cold Springs, etc. Port Hope Gospel Hall — Cavan St. at Highland, 11 AM — A very small conservative evangelical church in the Brethren tradition. Other area churches include Port Hope United, The Parish of Perrytown (Anglican), New Hope United Church (Welcome), St. Paul’s Presbyterian, Our Lady of Mercy R.C. The first six local organizations listed here depend on the financial support of people like you. Salvation Army Family Services — Swayne Street at College, Cobourg — Various types of social and economic support to individuals and families in need, including Good Food Box program, Collective Kitchens, etc. Northumberland Christian School — Danforth Road, Cobourg — Day school grades K-8; Member of the Ontario Alliance of Christian Schools. United Christian Broadcasters — Cobourg’s Christian Radio station at 90.7 FM with studios located at 150 King Street West. Also 102.3 in Belleville. Christian Horizons — Ministry organization based in Western Ontario operates six facilities in Port Hope and Cobourg. Better Together Refugee Partnership — Several churches participating in a project to, when completed, bring seven refugee families to Cobourg and Port Hope. Facebook page link. The Gideons — National Bible-distribution organization has a local chapter. Scriven Christian Academy — Toronto Road, Port Hope; emphasis on individual learning using home-school materials in a group setting. Note: This school is ultra-conservative; King-James-only. Alliance Family Centre — Daycare, preschool and after-school facility operated by Cobourg Alliance Church, 1333 Ontario Street. Age: Infant and up. Usually a waiting list to get in. In addition to the charities listed here, we have people in the community who work for national organizations such as Shalem Mental Health, Mustard Seed International, Mission of Tears, and the Global Engagement team of Youth for Christ Canada. Eddystone Baptist Church — An historic, 180-year old building with a traditional service. Exit the 401 at Grafton and go north, veering right (east) at Eddystone Road. Church is on the left. Prospect Missionary Church — in Colborne on the main street in the town’s east end. Evangel Pentecostal Church — In Brighton.